US Attorney General Jeff Sessions listens as Donald Trump delivers a speech at Manchester Community College in Manchester, New Hampshire, on March 19, 2018. For a short week, there was a lot of activity in the Russia investigation. Because it’s all intermingled with the Trump circus and Roseanne and Michael Cohen it kind of turned into a muddle. A few things happened that may be of serious significance and a few others might just be diversions that don’t amount to much. It’s unclear at this point which are which. You will recall that the buzzword on everyone’s lips last week was the president’s oh-so-clever new slogan “Spygate.” The Department of Justice had succumbed to pressure to allow the president’s henchmen to see some highly classified information about the FBI’s use of a confidential informant in the early stages of the Russia investigation. After a bit of a brouhaha, it was agreed that members of both parties should see the information and everyone waited with bated breath to see what they learned. Coming from the man who grilled Hillary Clinton for 15 hours over Benghazi, it seemed to carry some weight. Suddenly Trump’s congressional supporters were unavailable for comment and Fox News personalities Bill Hemmer and Judge Andrew Napolitano backed Gowdy. In one of his dozen or so media appearances, Rudy Giuliani declared that the president still demands to see the documents before he sits for an interview with special counsel Robert Mueller, but nobody paid any attention. The Trump fever swamp is still blathering about “Spygate” as if it’s a real thing. Everyone else has moved on. If I were the president and I picked someone to be the country’s chief law enforcement officer, and they told me later, “Oh, by the way, I’m not going to be able to participate in the most important case in the office,” I would be frustrated too. There are lots of really good lawyers in the country, he could have picked somebody else! Gowdy’s sycophantic comment dramatically undercut his shiny new image as a “man of integrity.” If you believe in the rule of law and the Justice Department’s independence, it doesn’t matter whether the attorney general is personally “participating” in the biggest “case in the office” since you have a deputy attorney general more than capable of handling it. Gowdy was obviously trying to curry favor with the president after throwing cold water on his clever new slogan. And it worked. Trump ignored Gowdy’s comments about “Spygate” but tweeted that quote adding that he wished he hadn’t hired Sessions. That isn’t a big secret, of course. Trump has made it crystal clear that he loathes Jeff Sessions for recusing himself from the Russia investigation. He expected Sessions to be his Roy Cohn, his personal bodyguard and hatchet man, as attorney general. 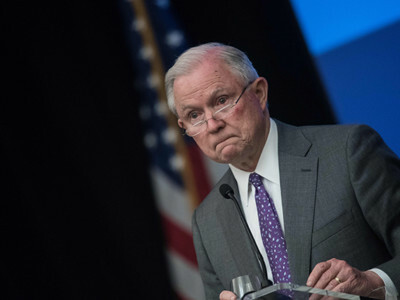 On Wednesday night the New York Times reported that Trump had not only threatened to fire Sessions and then demeaned him in public, clearly hoping to get him to quit, he also asked him to rescind his recusal, even after Mueller had been appointed. Sessions is reportedly being protected from Trump’s wrath by some high-level Republicans in the Senate. Nobody is quite sure why the attorney general is enduring all the humiliation and stubbornly clinging to the office. But it is a bit clearer now why Trump’s attorney Jay Sekulow transcribed so many queries about Sessions in his list of Mueller’s possible questions for the president. Sessions was reportedly interviewed by Mueller for several hours. Perhaps he had a story to tell. This may be one of the most egregious examples of “You can believe me or you can believe your lyin’ eyes” yet. We’ve all seen the video where he says, “When I decided to just do it [fire Comey], I said to myself, I said, you know, this Russia thing with Trump and Russia is a made-up story, it’s an excuse by the Democrats for having lost an election that they should have won,” at least a hundred times. That’s a sentiment our imperious president, who uses his plenary pardon power just to show he can, undoubtedly loved to hear. But it doesn’t bode well for what we used to call the rule of law. Deciding what crimes can be prosecuted wasn’t one of the president’s “awesome” powers, at least until now. And the week isn’t quite over yet. Heather Parton is from Santa Monica, California. She founded the blog Hullabaloo. Sessions ultimately refused Trump’s demand. Trump may wish to celebrate Mueller’s statement that he’s a “subject,” not a “target.” He’d be wiser to shut up.